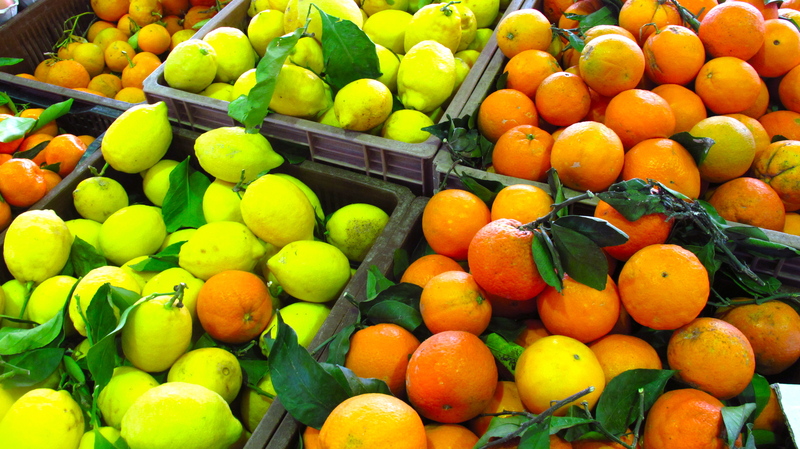 If one can describe cities in colors, then Nice will assume golden hues: the brilliant sunshine that welcomed me warmly to the Cotê d’Azur; the citrus trees lining the streets, branches laden with lemons and oranges; the short, old buildings painted in the same cheerful colors. We teared into a piping hot portion of socca at Lou Pilha Leva, Nice’s version of a fast food joint purveying local specialities. 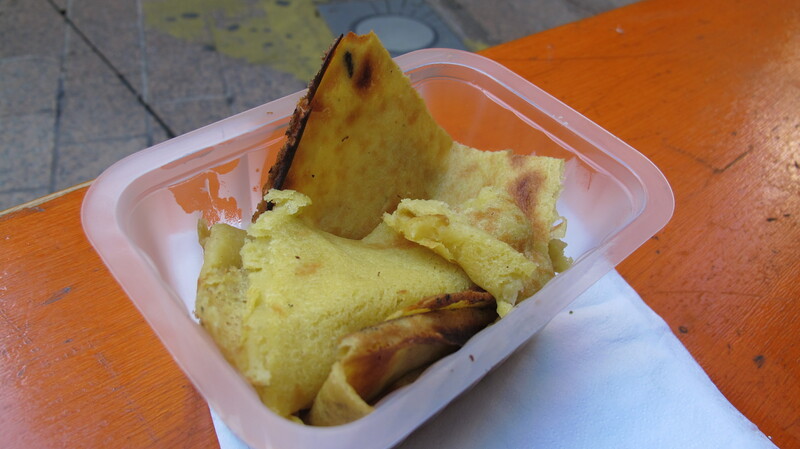 The golden chickpea pancake, mostly soft with blistered edges was quite delicious, redolent with nut and olive oil flavors. I can only imagine it being better if it was a few degrees crispier. While waiting for our socca cook in the hot stone oven, we gazed longingly at the oversized pan bagnats in the display, basically salade Niçoise in a bun. Never mind that we had just finished a pan bagnat not 15 minutes ago, the tuna salad amped up with olives and the characteristic dousing of olive oil that gives the sandwich its “wet-bread” moniker. A slice of Pissaladière completed our tour of the trinity of Niçoise snacks. 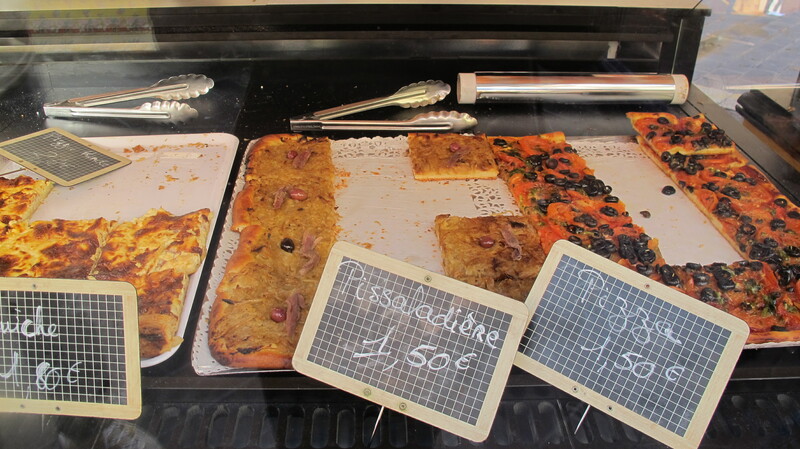 The portion we bought from a market vendor at the daily Cours Saleya market was somewhat stingy on toppings, but the main components of sweet caramelized onions, olives and pungent anchovies were present on the crispy not-quite-pizza like base. The commingling of sweet, salty and funky, to my surprise, was pas mal du tout! 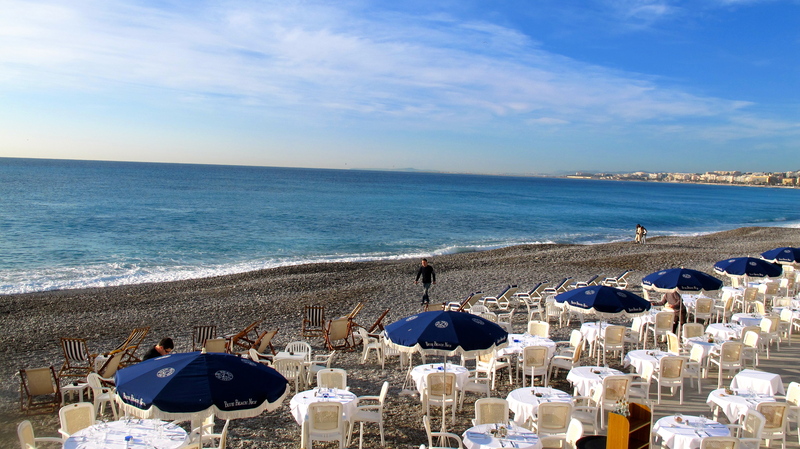 Unlike in Paris, people seem to be constantly eating on the go in Nice, so why not amass some snacks, head to the beach, and enjoy a spontaneous picnic while you’re at the Cotê d’Azur? 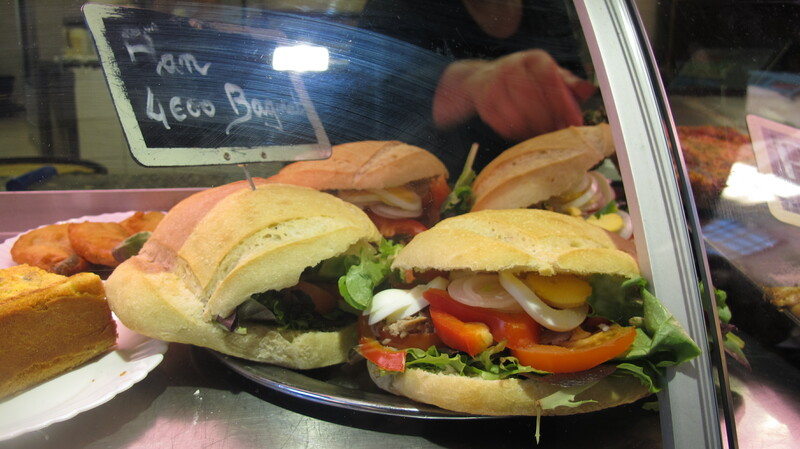 This entry was posted in Beyond Paris, Côte d'Azur, Cuisine, Eat out, dine in, eating out, food shopping, Location, Snacks, Traditional French and tagged cours saleya market, restaurants in nice. Bookmark the permalink. Pingback: Bonjour, Nice! « ciao bologna!